The former player is goalkeeper Les Sealey who has suffered a fatal heart attack at the age of 43. Sealey was goalkeeper coach at West Ham until the end of last season and left along with Harry Redknapp and Frank Lampard. He will probably be best remembered for stepping into the Manchester United side for the 1990 FA Cup Final replay against Crystal Palace as a replacement for the dropped Jim Leighton. “He came to me from Coventry and was superb in the dressing room. He was very popular with his team-mates and worked tremendously hard in training. He took that through to coaching and had a superb career and our thoughts have to be with his sons and his family. "Harry Redknapp told me he was an excellent goalkeepers' coach. Harry said that Les would go a very long way. He has a son who is a goalkeeper at West Ham and we just hope he goes on and does wonderful things. Les was a typical East End boy - he came in occasionally with a couple of shirts to sell. He told lots of jokes, whenever anyone was down he was a great lifter of people, great for harmony and camaraderie. He was very popular with his team-mates. We had a wonderful team and Les was the goalkeeper. "But I shall remember him as a person, not as a footballer. He was a good guy and when he went to Manchester United, it was the most wonderful career move for him and he played in that cup final win when he replaced Jim Leighton in the replay and got a cup winners' medal. And I am sure all of his team-mates will be absolutely shocked. It is a terrible thing." “It's a massive blow to everyone that knew him. I spoke to Glenn Roeder this morning and the players are absolutely distraught. Les was larger than life. He was such a lovely, enthusiastic character. You could never meet anyone with more enthusiasm than him. 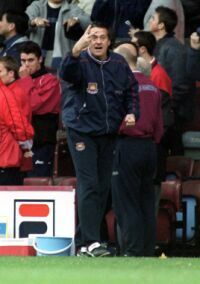 "He was a great goalkeeping coach and he absolutely loved West Ham. He was irreplaceable - no-one could have worked as hard as he did for the football club, or brought the personality to it that he did. The two boys, Joe and George, and his wife Elaine - they're a smashing family. It's a massive blow, it really is." Sheffield Wednesday have also announced the shock death of their 20 year-old defender Tom Staniforth who collapsed and died yesterday evening. “Sheffield Wednesday Football Club regret to announce the tragic death of Thomas Staniforth. Tom collapsed and died yesterday evening, aged 20. Everyone at Clarets Mad would wish to send their condolences to the families and friends of both and to Sheffield Wednesday and West Ham United Football Clubs.